Anyway, the football team is 3-8 heading into the final game of the season. Two of those wins did occur in the first month of the season, so that means yes, they did get previewed in this space: the opening game win over FBS opponent North Dakota, and, KU's first win over a D-1 opponent in more than a year, Louisiana Tech. The third win was pretty much a surprise to anybody- KU's first conference win since the Big 12 had, well, 12 teams. It was 2010 the last time the Hawks had a “one” in their conference standings, until they beat West Virginia this fall. 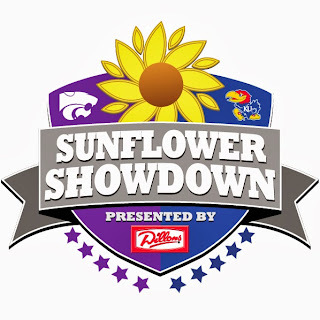 But Saturday's game isn't only the season finale, it's the Sunflower Showdown, KU vs Kansas State. 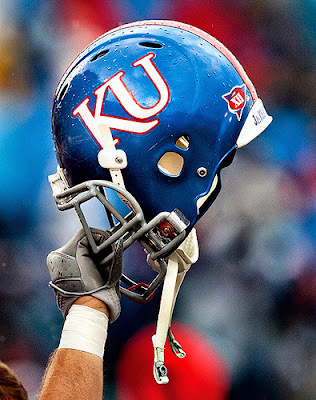 It's one of the oldest rivalries in college football (game 111, 5th oldest- KU leads the series 60-45-5), and these are two of the worst teams ever to play the game. No, I'm serious. I've been told, and I have no reason to disbelieve it, that K-State was the first college football team to ever lose 400 games. And KU was second. In 1987, KU entered the game 1-7 and K-State was 0-8. 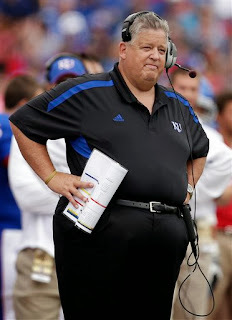 As you might expect, KU kicked a field goal in the final seconds for a 17-17 tie. The only time that both teams were ranked- THE ONLY TIME- was when I was there, it was 1995. KU was 6-0 and ranked 6th, K-State was 5-1 and 14th. K-State drubbed us 41-7 (that game was a freaking disaster. I can't find highlights, thank goodness). That was a long bus ride back from Manhattan. The interesting thing is that despite being in-state rivals, the Jayhawks and Wildcats have rarely ended the regular season playing each other. For more than 100 years, KU's must-win end-of-season rivalry game was Missouri. That history goes back a lot further than football- it goes back to the days of slavery, when Kansas was a free state, (thus, this awesome brewery) and Missouri wasn't. And one day, William Quantrill and his Missouri raiders came in and burned Lawrence to the ground. (In fairness, Kansas raiders would go into Missouri, so it wasn't exactly an out-of-the-blue thing. But burning an entire town to the ground was a little extreme.) 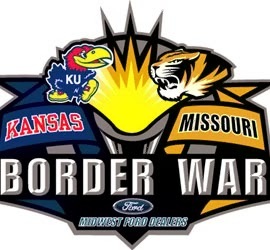 So when they called the football game a “Border War,” they weren't kidding. For realz, as the kids say. That sports rivalry ended when Mizzou jumped the sinking ship known as the Big 12 to the SEC. I can't exactly blame them as far as the money goes. But it still seems like junking that rivalry for the almighty dollar is a lousy thing to do. 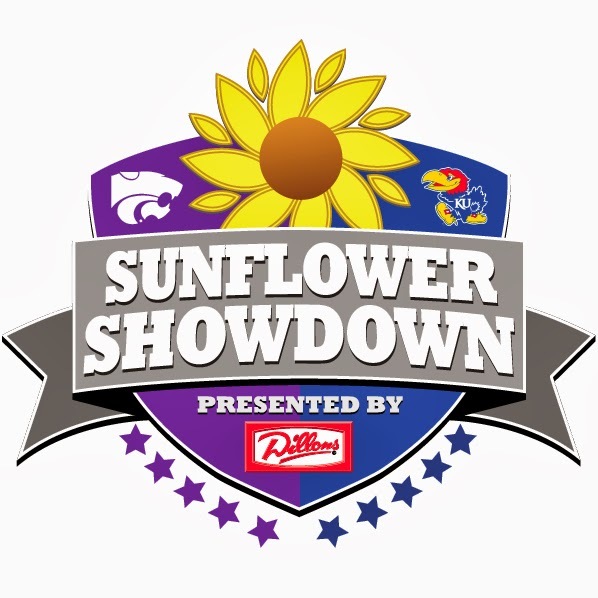 While Kansas and Kansas State may be rivals, the schools have made a pact that if (when) the Big 12 collapses, they will go into the same conference, which is a very classy thing to do. The schools realize that they will be better off in the long run if they stick together. When I was at Kansas, we played K-State in the middle of the season. It was fine, but more than one of us said, “I don't care if we beat K-State, so long as we beat Mizzou.” Really. And thank goodness we thought like that, because while I was there KU was in the midst of a 10-game losing streak to the 'Cats. Needless to so, there's not that Auburn-Alabama feel to this one. Still, it's always nice to send the Kitties back to Manhattan with the tail between their legs. Except heading into this one, the Hawks are two and a half touchdown underdogs (17.5). K-State is 6-5, 4-4 in conference and guaranteed to finish 5th no matter what happens at Memorial Stadium. Chances are real good they finish 7-5 and 5-4. There's no way this can be healthy. A quick word on K-State; I've actually seen them play more recently than Kansas. It was the Fiesta Bowl. This happened on the opening kickoff (I'm in the video, barely). As a KU fan, that was fun to watch. I don't hate K-State, but I don't want them to win at certain times. That was one of them. The best part about this game is that when it's over, it's all basketball season. Well, it's usually always basketball season in Lawrence anyway. Normal expectations for that team this season, too.